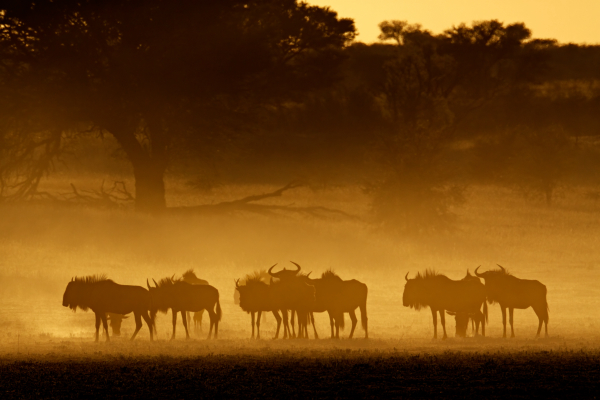 In the very corner of northwest South Africa bordering Botswana and Namibia lies Kwalata Safaris’ new 100,000-acre hunting block. In the extremes of this beautiful semi-arid to arid desert landscape, which surprisingly teams with life, incredible trophy quality is available for the taking. Hunters can expect the challenge of quick long shots on great trophies such as eland; blue and black wildebeest, springbuck, ostrich, steenbuck, duiker and for a little change of pace, great sand grouse shooting. A short flight from Upington to the Mier lodges nestled in the dunes makes this area a good option to combine with wing shooting located in the Free State or Cape Town. There are three rustic lodges within a short distance of each other hidden between the undulating dunes. Single story and built on a curve, they take on the shape of a dune and cleverly blend into the sparse beauty of the Kalahari. Each has two very large bedrooms, a bathroom, kitchen and outdoor entertainment area. Future upgrades are scheduled to match the quality of the accommodation with the quality of the game and the area. Larger hunting groups will be well accommodated here. Couples wishing for more luxurious accommodation can be pampered in lodges nearby. As you would expect with Kwalata, the concession boasts very nice skinning facilities with large cold rooms for the proper treatment of trophies. Stout vehicles are provided to withstand the harsh terrain and a friendly and professional staff are on hand to cater to the client’s every wish. For more information on Kwalata Safaris’ desert hunting block, contact Jaco Strauss at jaco@kwalata.com or www.kwalatasafaris.co.za.